Are you a manager or owner of an older apartment building heated by hot water radiators? Do your tenants ever complain of over-heating or open windows, especially in the spring and fall “shoulder” seasons? If so, some small changes in your mechanical room could save you as much as 30% in annual natural gas costs. While fan coil units have become the common mode of heat delivery in new buildings, most Toronto apartments constructed in the 1960s, 70s and 80s are heated by hot water radiators. Unlike fan coil units, which are controlled by suite-level thermostats, most radiators have no in-suite temperature control. Instead, temperatures must be controlled at the building level by adjusting the temperature of the hot water leaving the central boiler plant. A well controlled heating system will increase radiator water temperature as outdoor temperatures decrease, providing more heat to the building only as it is needed. During the spring and fall, when outdoor temperatures frequently hover above the freezing mark, buildings require radiator water temperatures in the range of 30-50 °C. Most boilers however, require water temperatures be maintained above 55 °C to prevent condensation and the formation of corrosive acids. To protect the boilers, many building heating systems are operated at a minimum temperature of 55 °C, regardless of the actual heating requirement. 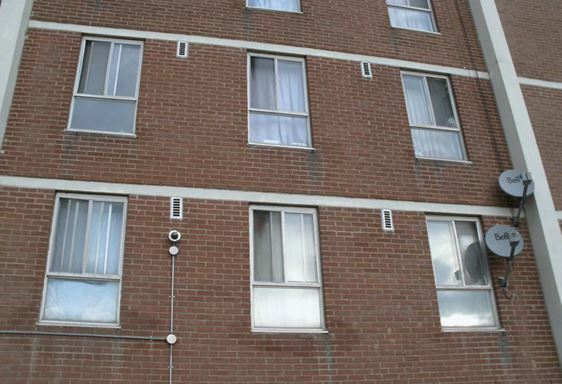 The result is overheated suites, causing residents to open windows for much of the heating season. In fact, a building operated at a minimum temperature of 55 °C is overheated 65% of a typical Toronto heating season. An overheated building can use as much as 40% more energy annually for space heating than a well controlled building. Toronto apartment building with open windows in early December, indicating overheating. Fortunately, it is possible to reduce temperatures while still protecting the boilers from low return water temperatures. In well-designed heating systems, there are two separate heating loops, commonly referred to as a primary-secondary system. 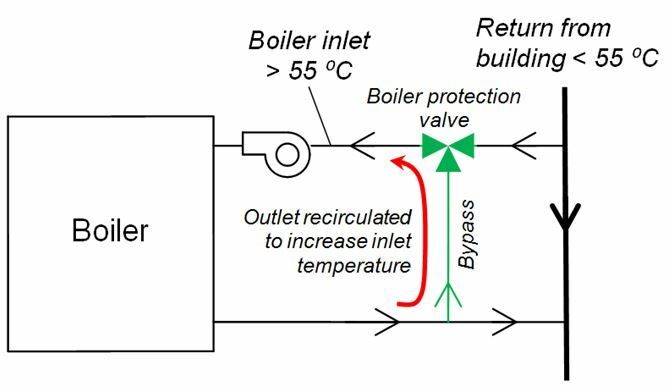 The primary loop can be kept at a high temperature to protect the boilers, while the secondary loop can be run at a lower temperature to avoid overheating the building. The two loops are linked by a mixing valve which regulates the temperature of the secondary loop based on the outdoor air temperature. The benefit of a primary-secondary loop can be observed by comparing two actual apartment buildings which are virtually identical and located on the same site in downtown Toronto. In this case, one of the buildings has been upgraded to include a primary-secondary loop while the other has not. The difference in performance is particularly notable when the heating system is first activated in early October. The building which does not have a primary-secondary loop sees a large jump in natural gas consumption as the heating system is brought up to the minimum 55 °C temperature. In contrast, the building with a primary-secondary loop sees a gradual increase in natural gas consumption as outdoor temperatures get colder. The result is 42% less natural gas used annually for space heating, savings $36,000 per year at current rates. While these results may be exceptional, space heating savings of 20-30% are not unusual. 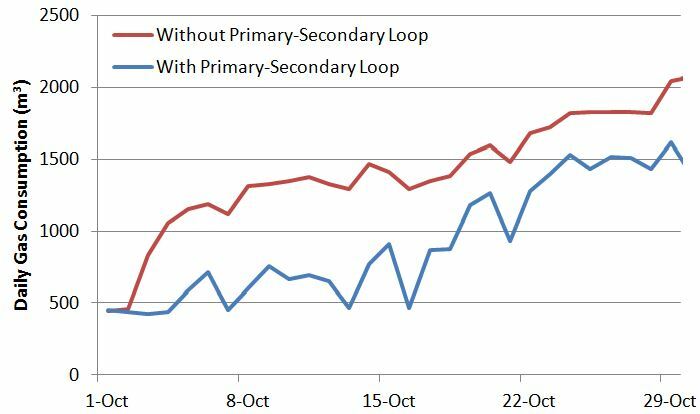 Impact of primary-secondary loop on October gas consumption. A primary-secondary loop is most easily created in an existing heating system by installing a mixing valve and bypass at the boiler, sometimes referred to as a boiler protection valve. The valve operates by bleeding some of the boiler outlet water back into the boiler inlet, raising the boiler inlet temperature. This arrangement allows the building to operate at a cooler temperature, while still providing the hotter water required by the boiler. In this way, the mixing valve protects the boiler from lower building water temperatures while eliminating overheating in the suites. The result is a considerable reduction in natural gas costs, as well as a more comfortable environment for residents. A boiler protection valve allows for lower building temperatures. At an installed cost of $2000 to $4000 per boiler, adding boiler protection valves is a low-cost, high-return investment for any building without a primary-secondary system. Boiler protection valves can operate autonomously, or can be controlled by the building automation system. In both cases, the building automation system will need to be adjusted to permit lower building loop temperatures. The process of fine tuning is essential to achieving good performance, and can take several seasons to optimize properly. All too often upgrades are made and are functional, but are never optimized, preventing savings from being fully realized. To properly optimize and fine tune any heating system, real-time feedback is required and hourly natural gas data is a critical component. Often hourly data is available directly from the utility (such as Enbridge) or can be gathered locally via an on-site data logger. Portals such as EnergyBrain make this data available online, providing property managers with continuous feedback about their building’s performance. Hourly utility data can also be used to easily identify sites without primary-secondary loops, or other operational issues impacting utility costs. In this way, resources can be directed towards the greatest opportunities within the building portfolio, maximizing the investment value. This approach to building management – focusing on operational improvements and smaller, targeted capital investments – is the most cost effective first step in reducing portfolio utility costs. Larger capital investments, such as boiler replacement, can offer further improvements in efficiency and should be considered once these low-cost opportunities have been exhausted. Looking for more information? Have a question about this article? Email sam.vanberkel@watershed.ca.